5-Year-Old Hungry Boy in Michigan Calls 911 With McDonald's Order and a Police Officer Delivers! Mumbai, April 10: World Cup hopeful K.L. Rahul slammed an unbeaten hundred, his first in the Indian Premier League, as Kings XI Punjab also rode on Chris Gayle's pyrotechnics to post 197/4 in 20 overs against Mumbai Indians here on Wednesday. Rahul (100 not out off 64 balls) and Gayle (63 off 36 balls) joined hands for a 116-run opening wicket partnership to give the away side a blistering start. While Rahul hit six fours and six sixes, Gayle bludgeoned seven maximums and three sixes. 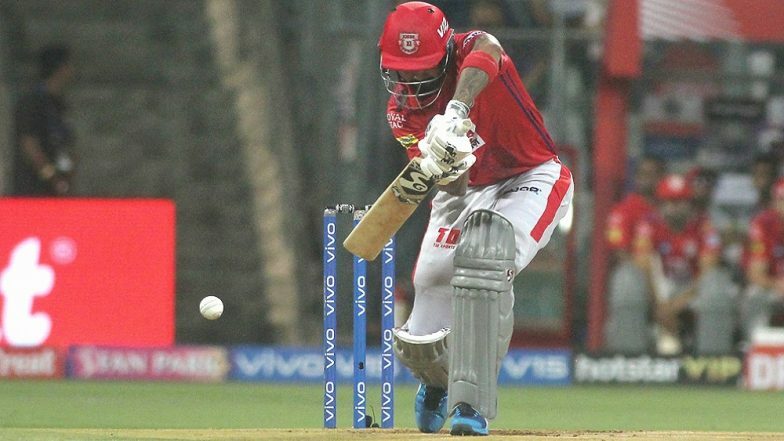 Gayle was dismissed in the 13th over after which Kings XI slowed down a bit. But Rahul ensured they get to a above par score by smashing Hardik Pandya 6-4-6-6 in the first four deliveries of the 19th over and then hit Jasprit Bumrah for a four and six in the final over as 38 runs came in the last two overs. India’s Likely Squad for ICC Cricket World Cup 2019: KL Rahul Could Find a Place; Rishabh Pant, Dinesh Karthik Might Miss Out. Gayle, typically, took time to get going and it was only in the fifth over that the legendary West Indian changed gears by hitting Jason Behrendorff for three sixes and one four as the Aussue leaked 23 runs. Kings XI were 50/0 at the end of Powerplay with both batsmen looking in ominous form. Rahul hit last match's hero Alzarri Joseph for a delectable six and a four in the seventh over to continue his good form with the bat as Mumbai bowlers looked rudderless without captain Rohit Sharma who could not play due to an injury. There was no stopping Gayle as he plundered a six and two fours off Pandya in the ninth over which costed the home team 17 runs as Kings XI raced to 93/0 at the halfway stage. Gayle then brought up his 26th fifty in the IPL off 31 balls by smacking Krunal Pandya for a six in the 11th over. Punjab badly needed to break the partnerhip and Behrendorff did it, coming back to remove Gayle. Trying to hit another six, Gayle holed out to Krunal Pandya at deep midwicket. David Miller (7) did not last long, caught behind by Quinton de Kock off Hardik Pandya as the scoring slowed down. Karun Nair -- playing in place of injured Mayank Agarwal -- followed suit managing only five runs before nicking one to de Kock behind the stumps of Hardik Pandya. Sam Curran (8) tried to be cheeky but Bumrah got the better off him as the England all-rounder scooped one to de Kock. But just when it looked like Mumbai had successfully reined in, Rahul went berserk in the last two overs.